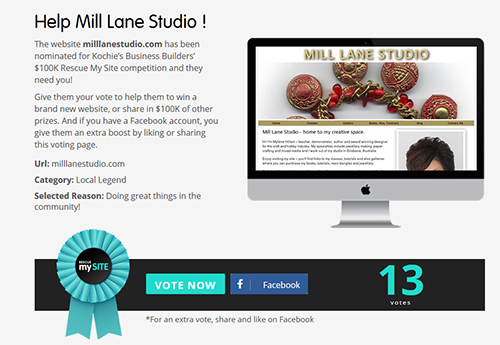 Mill Lane Studio: Mill Lane Studio Earns Nomination for "Kochie's Business Builders"
Mill Lane Studio Earns Nomination for "Kochie's Business Builders"
Yesterday, Mill Lane Studio was nominated in "Kochies Business Builders" rescue-my-website competition for "Doing Great Things in the Community". I didn't know whether to jump for joy or to cry! So I put it out there to my Facebook friends for their thoughts on whether I should accept the nomination or not and I got a resounding "You deserve it, so go for it" response. With so much enthusiasm behind me, I accepted! But now I need to turn all that enthusiasm into votes to get to the second stage of the competition. And this is where I need your help. Please show your support for my nomination by clicking the link below and voting. And if you click the FB link on the voting page and share to your timeline, you give my nomination an extra vote whilst spreading the word even further! So if you think I do great things in our jewellery-making/craft community, vote and tell the whole world about it and help me get me one step closer to a brand new, professionally designed and very spiffy website. I would really appreciate your help in getting the word out there!